After having a superb dinner at The Restaurant at Rancho Valencia I resolved to make it down to San Diego more often. 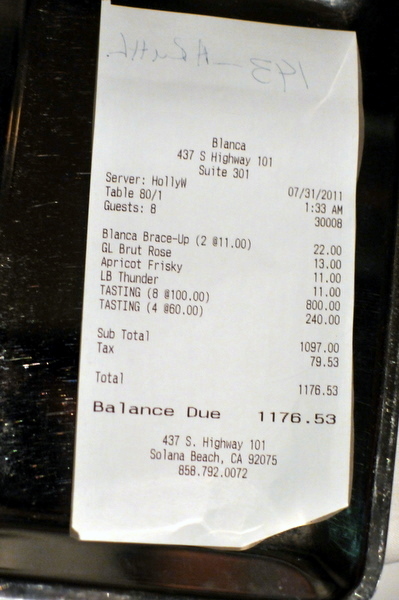 On my own, I probably would have dismissed Blanca out of hand, labeling it more of a trendy restaurant with a clubby atmosphere and live music designed to cater to tourists. However, during the aforementioned dinner all of the SD natives cited Blanca as the area's best restaurant and the fact that one of them works at Addision speaks volumes about the endorsement. Reviews on Blanca are fairly mixed though I suspect turmoil in the kitchen between late 2009 and early 2010 had a lot to do with this. 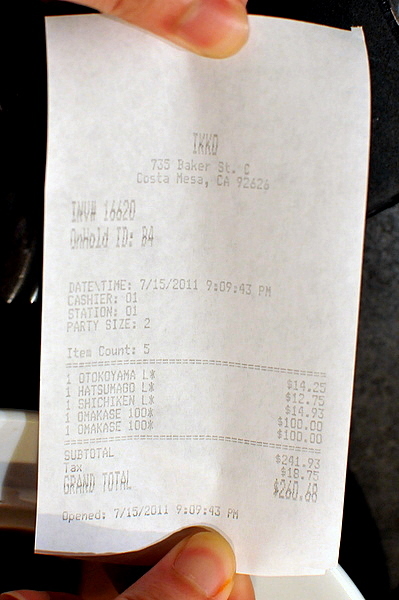 The restaurant's first CdC, Wade Hageman, left in fall 2009 and his replacement, Jason Neroni, only lasted five months. Since summer of 2010, the kitchen has been led by Gavin Schmidt who has emphasized a progressive farm-to-table approach to Californian cuisine. Prior to Blanca, Chef Schmidt's resume is centered almost entirely in San Francisco where he was sous chef at Aqua, exec chef at Campton Place, and most impressively CdC at COI, which remains my favorite restaurant in the city. Wonderfully airy with a delicate crispness the dish reminded me of French toast with a savory note from the bacon coming into play on the finish. 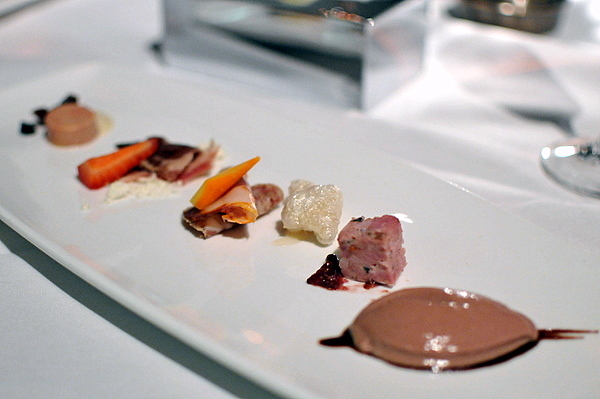 First up was a spontaneous sextet of charcuteries including: duck liver mousse, Pate de Campagne, Chicharon, Copa & Sopressata, lamb speck, and a foie gras torchon. The table favorite was the Chicharon, delightfully crunchy with a flavor reminiscent of Chinese roast pork skin, a kiss of honey gives the skin a very slight sweetness. The torchon was another high point; the artichoke and licorice balancing the rich velvety foie with a bitter vegetal temper. Next up was a beautifully composed plate of fresh vegetables with a slight molecular touch in the form of two small spheres. Oddly rather than eating the spheres whole, we were told to rupture them and let the liquid mix with the citrus vinaigrette. 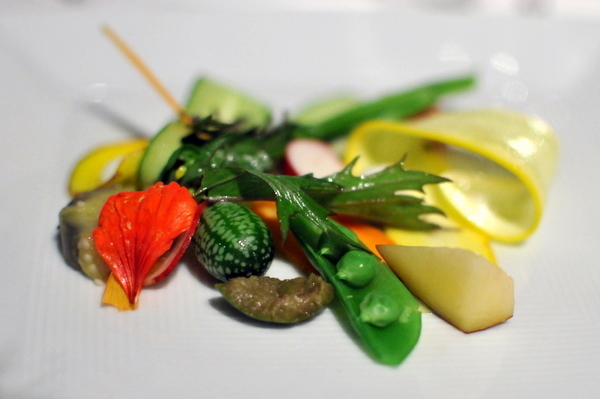 The vegetables were crisp bright and varied, a playful melange of bitter, tangy, and sweet while the dressing added a lovely herbal tone to the mix. 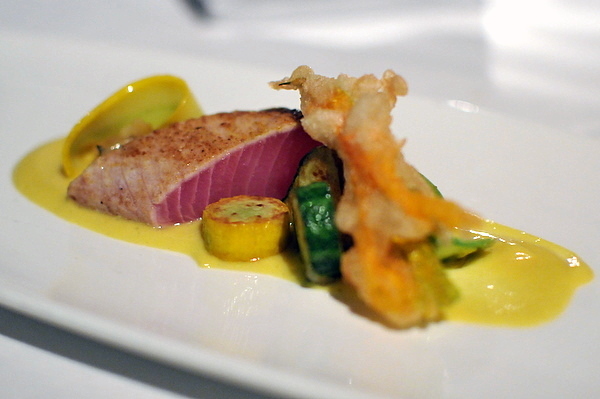 The still life is one of Chef Schmidt's signature dishes. In keeping with his emphasis on eating local, Chef Schmidt forages for the seaweed used in this course. Our server likened this dish to a tide pool and visually it reminded me of the Oysters Under Glass from COI. A wonderful course all around, the dashi and avocado gives the dish a palpable savory tang, but the absurdly fresh seafood remains the star of the show. 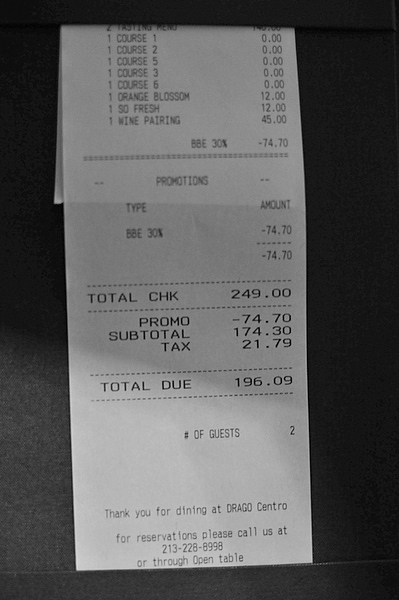 It was a testament to the dish that the table was evenly split as to which shellfish was their favorite. 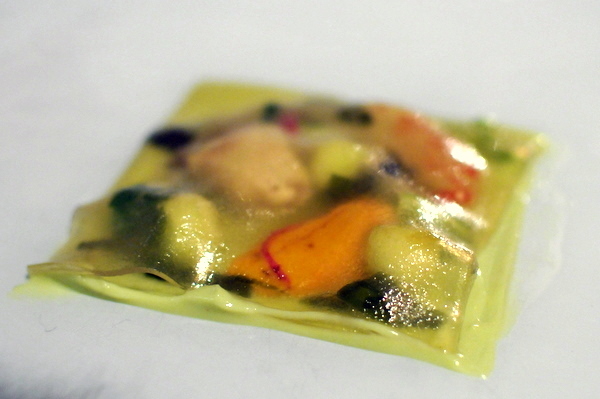 Though called a salad, this course was actually more of a deconstructed soup. The "dressing" is actually traditional gazpacho and the vegetables were variants of the soup's ingredients. The result is the expected freshness and levity married to a slate of disparate textures. 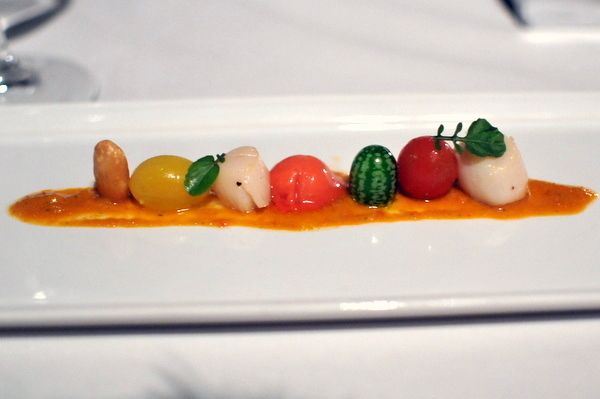 The scallops added a meaty salinity, though the vegetables could have stood on their own. 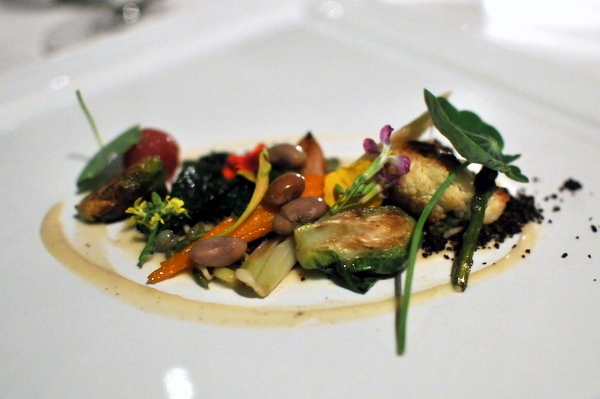 This was another example of simplicity and freshness resulting in a beautiful vegetable course. The asparagus provided a robust vegetal smokiness to the milder burrata and egg while the gentle citrus twang kept the dish from being too one note. 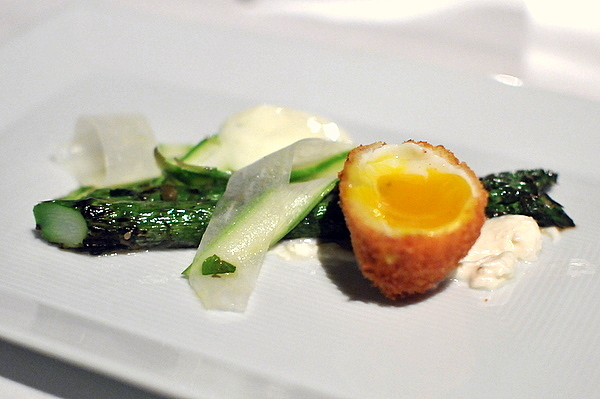 Fittingly the texture was equally complex ranging from the crisp breaded egg, to the tender asparagus and smooth creamy burrata. The fish looked a bit pink for yellowtail but it was cooked beautifully nonetheless. Delightfully clean and fleshy the fish needed the accompaniments to give it some flavor. What impressed me the most was the sauce, a restrained vadouvan base mixed with spicy ginger and a distinct funk from the kimchi. 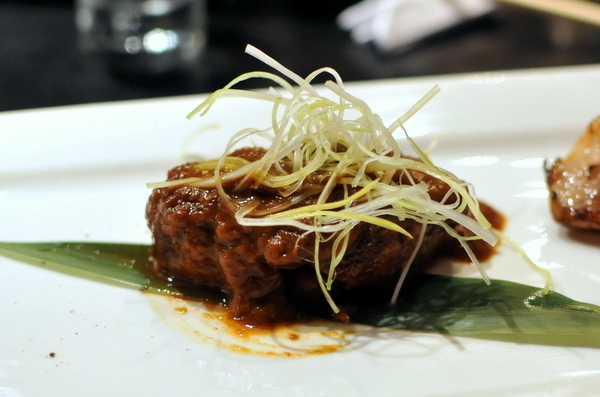 The result was a curry that draws inspiration from both Indian and East Asian sources. Overall this was one of the weaker courses of the evening. I would have liked a bit more firmness from the rice and a for there to be a bit more of the octopus. The brine of the mollusk is apparent in the ink and when paired with the plum resulted in a disjointed savory sweetness. This was one of the best halibut presentations I've had in quite some time. 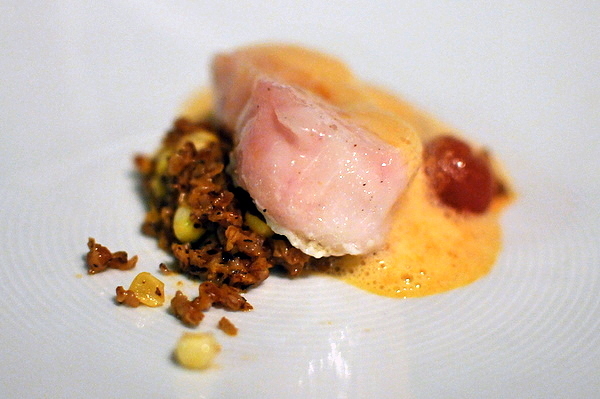 The fish had a rare pinkish tinge and fittingly succulent texture deftly balanced by the coarse grainy sweetness from the amalgam of corn and wheat. 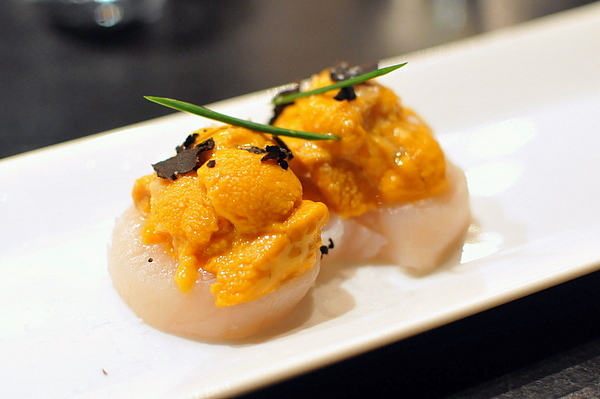 The mixture of tomato and uni lends the fish a tang as well as a suitably weighty gravitas. One of my companions suggested adding a bit of salt which effectively heightened the other flavors on the plate. I was surprised to see another composed vegetable plate but quickly came to appreciate the chance to compare the differences between the raw and cooked preparations. The day on the farm was noticeably sweeter yet at the same time conveyed a satisfying savory weight with subdued residual herbaceousness. Simply labeling this grilled belies the amount of work that went into the meat which was smoked for two hours and sous vided for 72 more prior to being finished on the grill giving the brisket a satisfying multifaceted texture. Unfortunately lady luck conspired against me on this course and my roasted padron pepper was intensely spicy and completely overshadowed the other flavors on the plate. Our final savory course was a single spar off a rack of lamb. The meat itself was typical of lamb, but instead of the green grassy flavors I was expecting I got an almost truffle like element out of the dish. 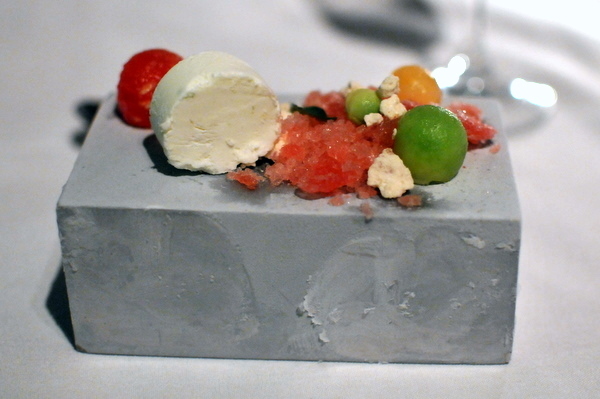 Our first dessert came out on lovely frozen metal blocks, the flavors were varied and complex with the savory goat cheese rising to the fore, a bright interlude of sweet juicy melon, and finishing with the floral bite of the peppercorns. 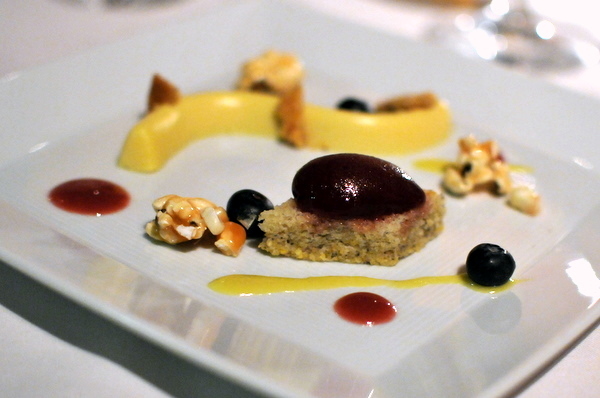 The second dessert was substantially heavier, sweet and cakey with flourishes of ripe berry and a savory undercurrent from the corn and polenta. The airy sugary exterior dissolved quickly yielding a jammy sweet core. These were a gift from Stephanie, ironically enough it was her birthday, fortunately the restaurant came to our rescue. 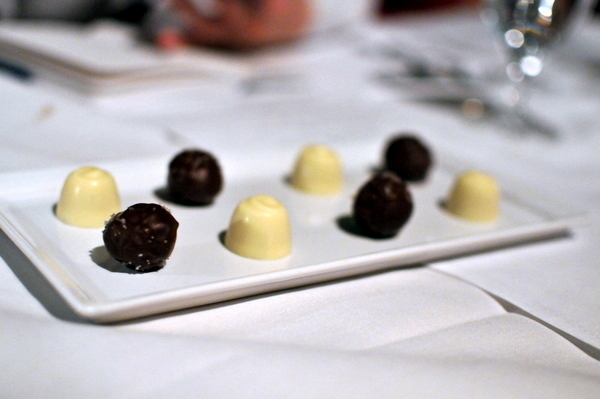 The meal ended with a pair of chocolates: a white chocolate with kaffir and lemongrass and a dark chocolate with peach liquer and sea salt. While I haven't been to enough restaurants in San Diego to dub Blanca the best, the restaurant certainly makes a strong case for itself. Chef Schmidt's focus on seasonal local ingredients pays huge dividends with the freshness and flavor evident in every course. Chef Schmidt puts his past training to good use, incorporating avant-garde flourishes that give provide a cerebral complex feel without compromising the food's integrity. Drago Centro has been on my list of places to try for quite some time, but other commitments and the generally lackluster comments, particularly in regards to the service, kept me away until now. The restaurant is one of several restaurants owned by Chef Celestino Drago and his family. Day-to-day the kitchen is run by CdC Ian Gresik, a Patina alum who spent time studying in Italy, France, Greece and Spain before returning stateside and taking the reins at Centro. Drago Centro offers a fairly contemporary selection of cocktails in addition to a couple of Italian classics. We opted for two of their newer offerings. Despite the name, the strongest flavor actually came from the berries. 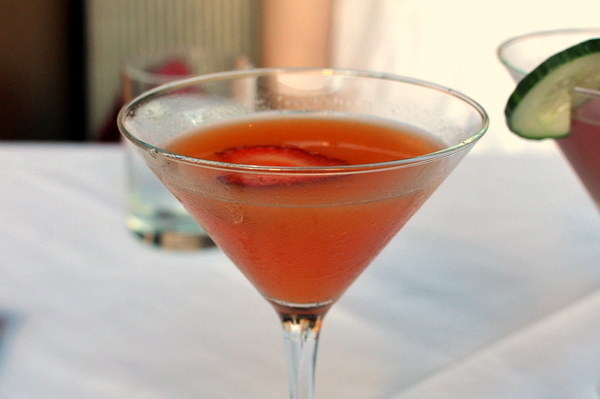 The drink was enjoyable though I would have liked to see more from the black peppercorn. I was going to try one of the bourbon based cocktails until the waiter recommended this cocktail. 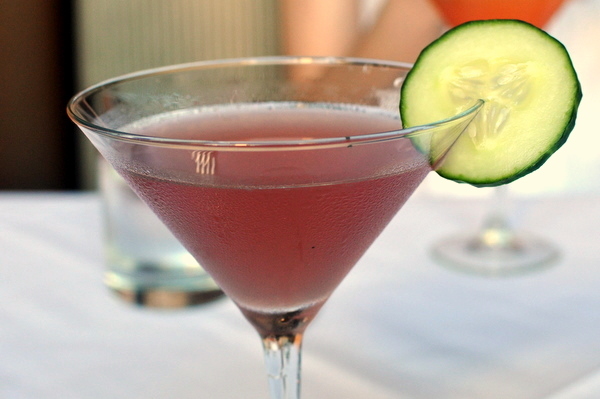 Vividly pink color aside, the drink was well balanced, with fresh acidity balanced by a bitter herbaceousness. 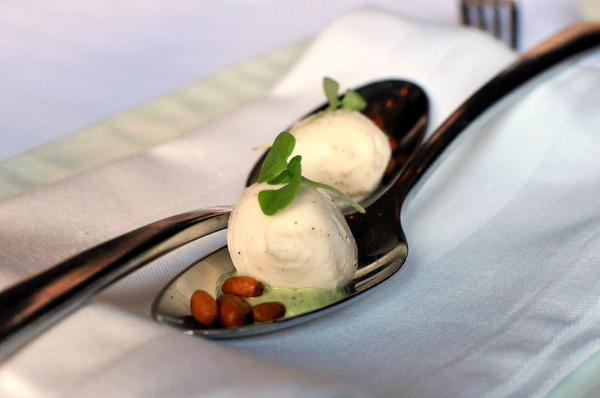 The purpose of an amuse is to excite the diner's palate for the meal to come and in that regard this was an abject failure. 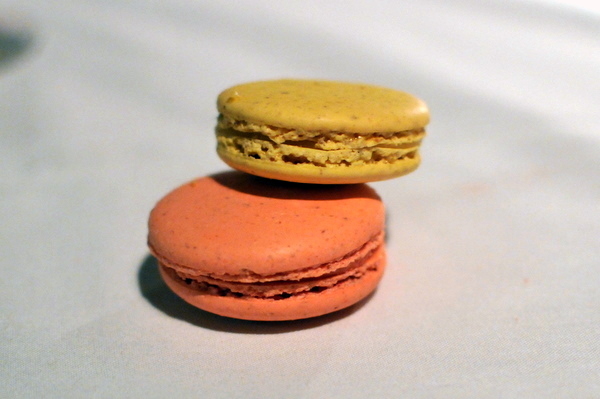 The individual ingredients were fairly boring and the combination felt equally boring not to mention clumsy. 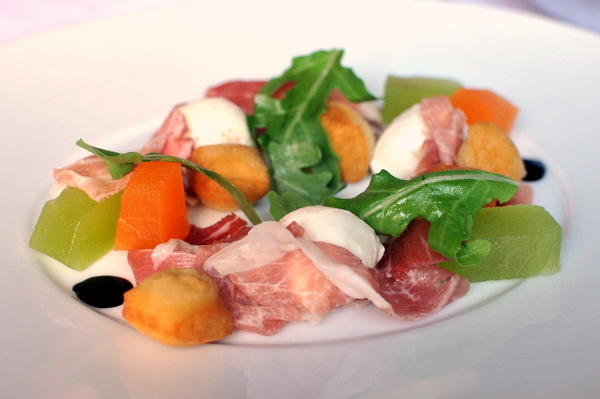 The first course built off the classic Italian combination of melon and prosciutto; the succulent salty sweet duo really coming into focus against the nutty vegetal arugula. The mozzarella and bread like croutons added weight but I would have preferred the salad without them. Branzino or Mediterranean Sea Bass is immensely popular in Italian restaurants so it was no surprise to see it on the tasting menu at Drago. The fish was perfectly cooked flaky dense and nicely browned on the surface. The fish was lightly seasoned but most of the flavor came from the broth. 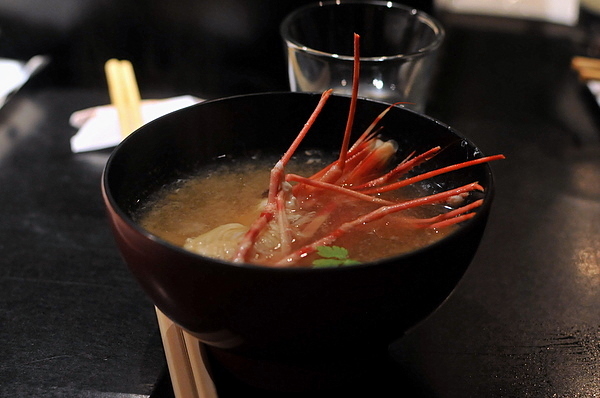 Infused with the umami richness of the shellfish, the stock built nicely on the subdued natural brine of the fish. 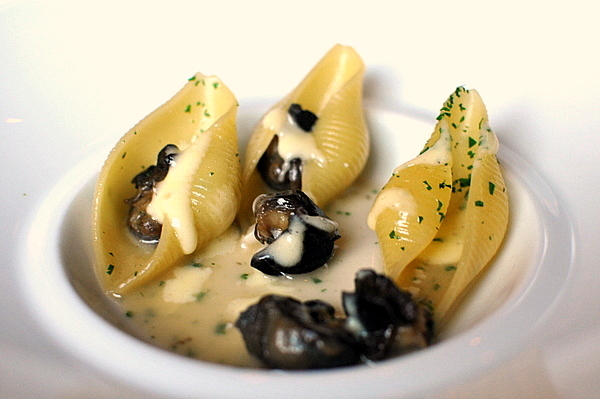 I quite enjoyed this dish, though cooking snails with butter, garlic, and herbs is more in keeping with French technique than Italian. The large conch shaped shells felt a touch undercooked but still served as a suitable wrapper for the heady sauce and earthy molluscan bounty. 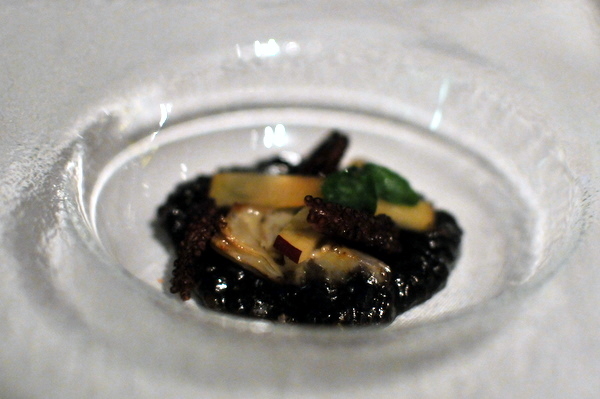 This was a fairly textbook straightforward of risotto, a mixed mushroom risotto with black truffle shaved table side. Our waiter sagely recommend that we mix the truffles into the dish and let the heat extract the fungi's prized essence. 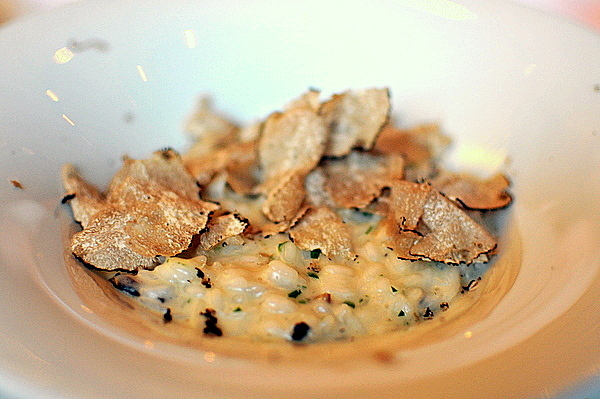 This proved to be one of the better truffle risottos I've had in a while; the flavors were spot on with the truffles. The meal so far has been solid but not remarkable, this course finally reached that next level. It goes without saying the pasta itself was spot on. 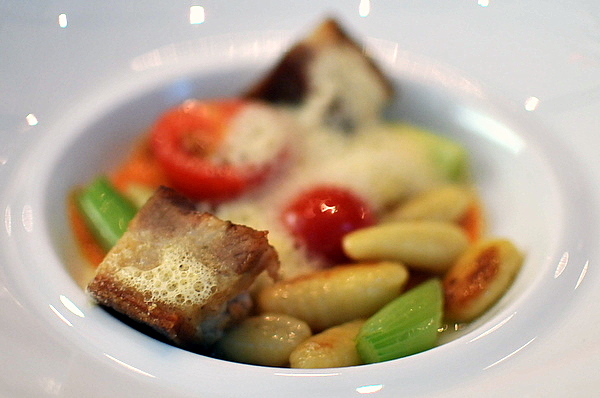 Dense and pliant, the gnocchi was perfect with the piquant spice of the tomato cream. The pork belly was absolutely superb as well, rich decadent and tender it provided the gravity and richness that made the dish immensely satisfying. 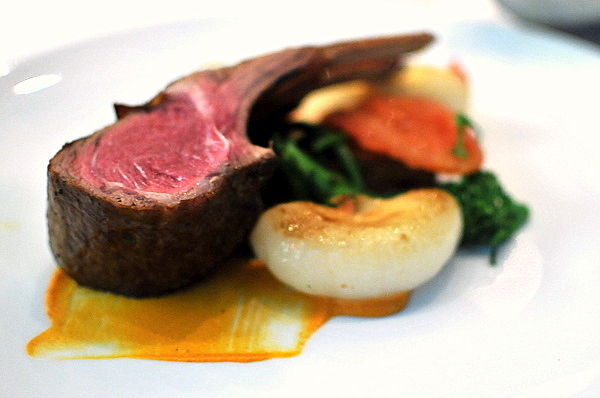 The final savory was a double lamb chop; though the meat was served fairly rare but remained a touch sinewy. 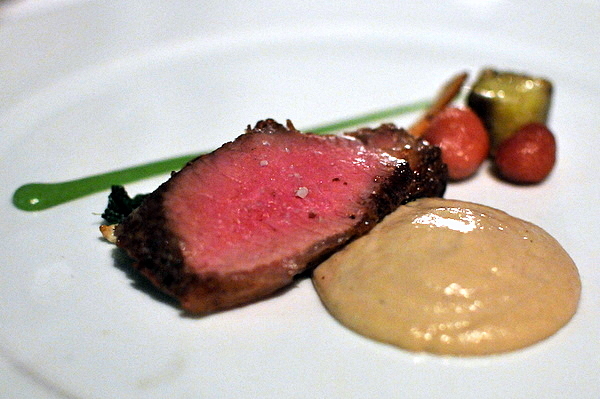 The lamb chop was nicely seasoned with an abiding gaminess that intertwined nicely with the romesco. The cipollini onions were a bit undercooked, giving them a spicy bite, though a sweeter flavor would have been more fitting with the rest of the course. 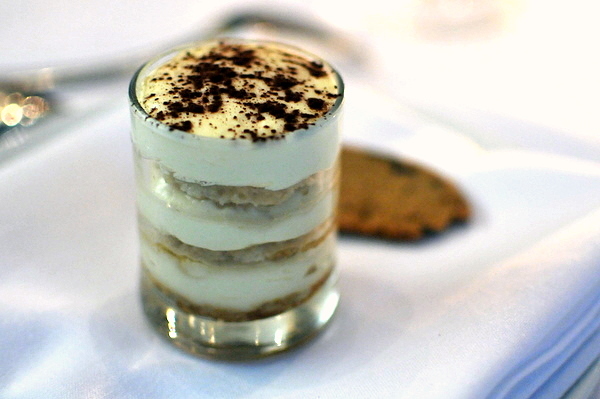 The dessert was fairly simple, classic tiramisu with the biscotti adding some much needed texture. 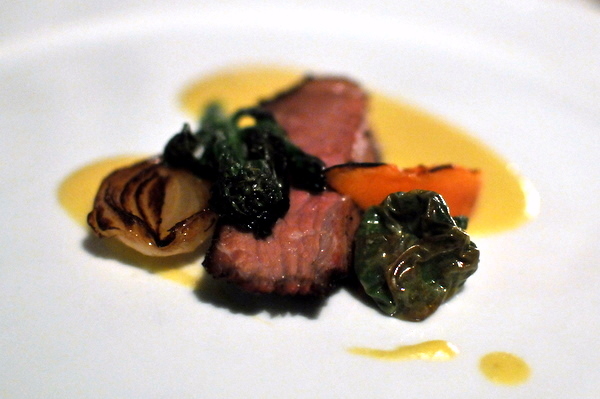 Though the meal didn't astound me, Drago Centro turned out better than I expected. 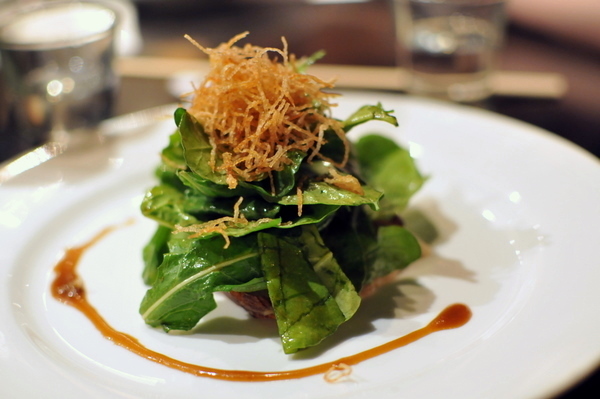 The food was generally enjoyable, nothing truly progressive but well-executed throughout. Service was actually quite smooth, some small mistakes but nothing that detracted from the meal and certainly nothing like the horror stories that I've heard. If you ever find yourself in Downtown with a craving for Italian I'd recommend giving Drago Centro a try. I've been on something of a Japanese/OC kick of late and with that combination it was only a matter of time until I found myself at Ikko; a contender (albeit a divisive one), for best the best sushi restaurant in Orange County. The restaurant The restaurant can be difficult to find, situated in a dark seedy strip mall complete with adult novelty store. 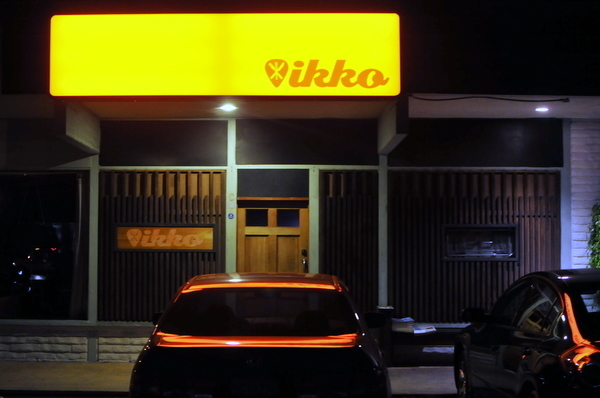 Even Ikko's exterior seems vaguely foreboding with its wooden facade complete lack of windows. 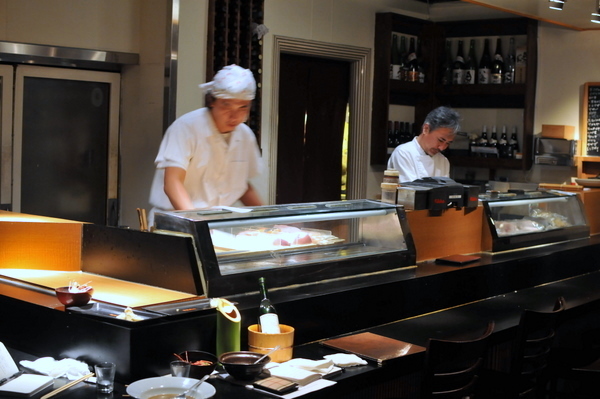 The interior is par for the course, a long L shaped wooden sushi bar surrounded by a handful of tables. The dark wood motif of the decor is countered by bright spotlights above the bar which fittingly illuminates the most important part of the restaurant. 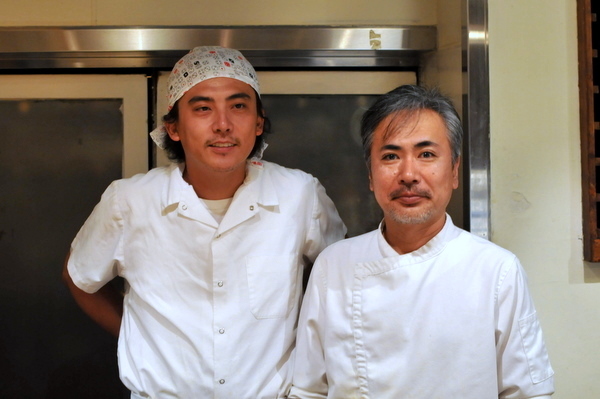 Behind the counter are two chefs, the elder gentleman is Ikko-san and the younger chef is Take who took care of us this evening. 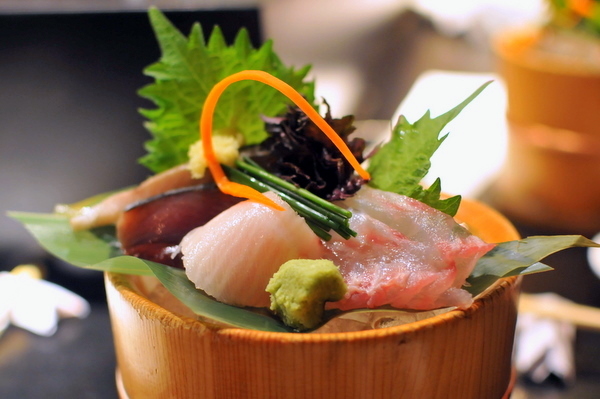 The first thing that stands out about the menu is the presence of intricately prepared dishes utilizing ingredients not commonly offered at Japanese restaurants. 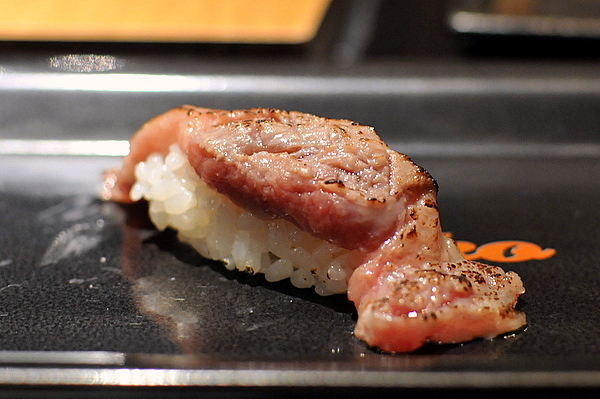 We opted for the $100 omakase which provided a good mix of cooked and raw courses. Every aspect of this dish was spot on, from the sublime earthy musk of the truffle to the sheer freshness of the seafood. The pungency of the truffles is coupled with a rising sweetness from the uni and scallop and perfectly accented by the savory sprig of chive and a fragrant pink peppercorns. 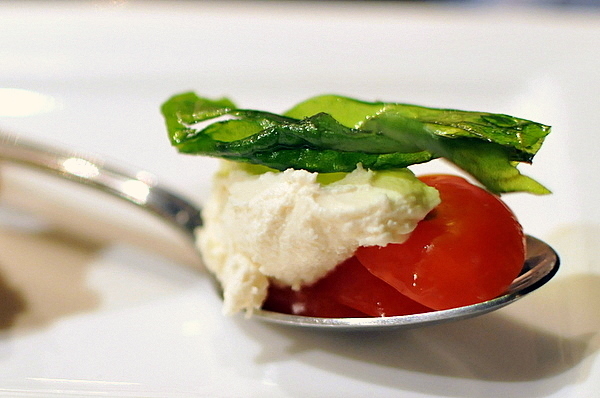 Next up was a delightful spoonful of caprese, the lithe vegetables are complimented by a suitably weighty cheese infused with the resonant essence of fresh yuzu. This turned out to be one of the best dishes of the night. The mousse is expectedly bright and vegetal while the fried potato's prodigious crunch provides an emphatic counterpoint to the edamame. 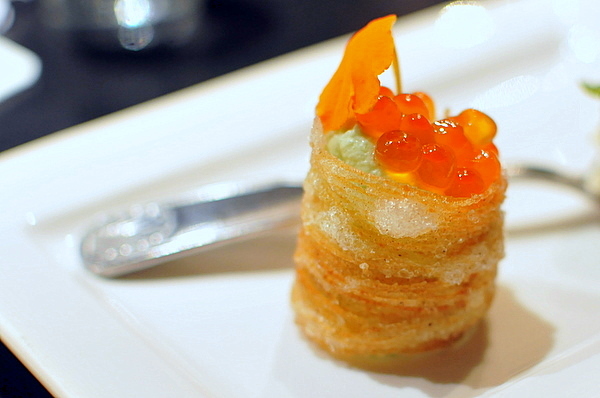 The ikura was a bit lost but the potato had enough savory flavor, making the roe unnecessary. First up was a Porgy which looked and tasted like snapper and according to Google is indeed one of the fishes called served in the states under the name "Tai." The yellowtail was easily the best of the bunch, oily fatty belly meat perfect with the chive's zest. 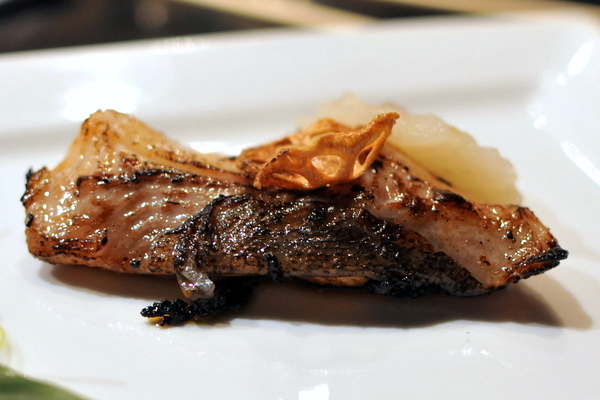 The bonito conveyed a smoky sapor that paired nicely with the spicy bite of the ginger. The last fish was a labeled as King Mackerel which was quite the break from the typical mackerel, soft fleshy with only an elusive hint of the characteristic oily flavor. Quite the departure from the typical chashu pork, the pervasive smoky aroma and supple fleshy texture reminded me of a cold smoked dry rub BBQ. I could have done with a bit less of the arugula, the a few leaves provided an effective bitter contrast to the pork, but too many overwhelmed the meat altogether. 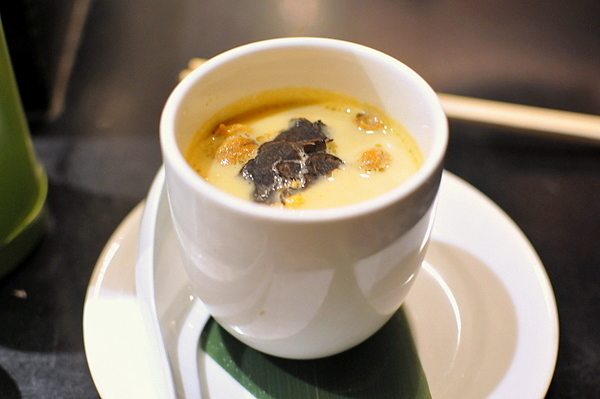 The egg custard came with more urchin and black truffle, not that I'm complaining though. 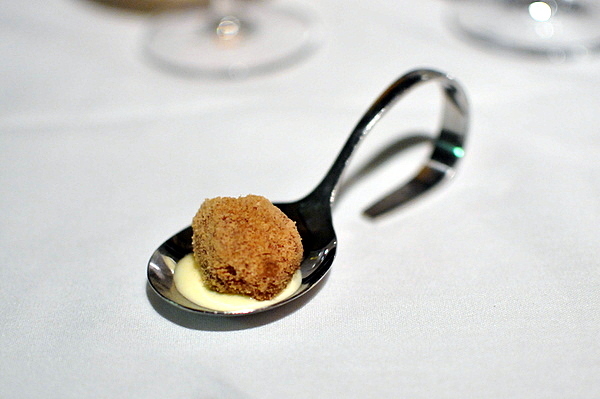 The porcelain egg custard was delightfully soft and silky; the perfectly absorbent base for the savory truffle and the syrup sweetness of the uni. 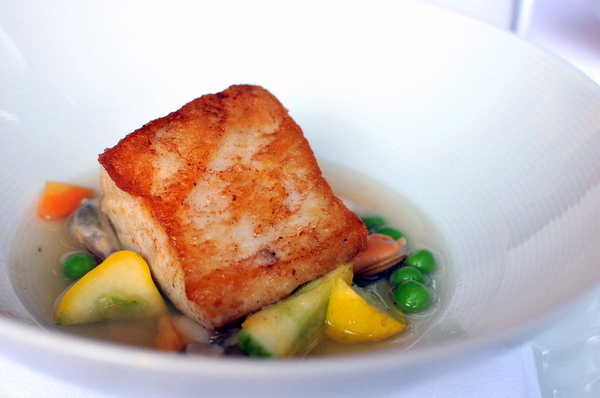 No omakase would be complete without some take on Nobu's classic black cod with miso. Ikko is more sparing with the miso leading to a fish that was still tender and flaky but a slight bit firmer than the norm. More importantly the fish wasn't overly saccharine and I could still taste a satisfying char on the fish. The guest next to me raved about this dish and he was absolutely right. The meat wasn't like your typical cooked beef tongue, succulent fatty and exuding a heady beefy richness with a touch of miso sweetness. Kevin likened this to Chinese red braised beef but I thought the flavor profile was more along the lines of a stew. My initial bite tasted a bit astringent but in subsequent bite the flavor of the shellfish helped to balance things out. 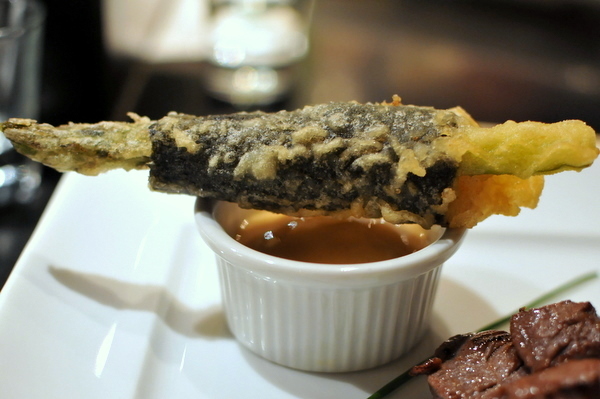 The sauce is a traditional tempura dipping sauce in mousse form, which added a creamy twist and highlighted the hot/cold interplay between the tempura and the sauce. Compared to the tongue we had just a couple courses earlier, this seemed almost laughably simple. 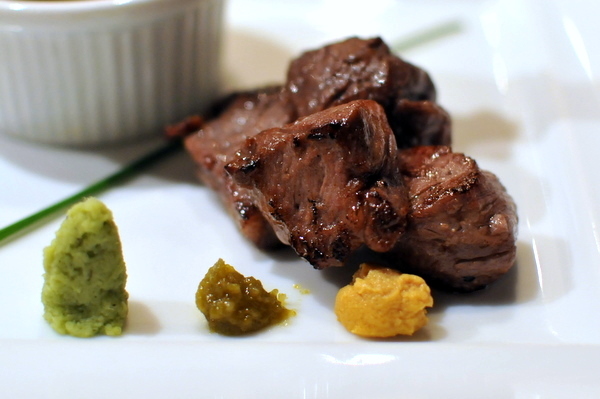 The use of miso was beginning to get a bit tiresome though I still enjoyed the a slick chewy mouth feel of the meat and the three sauces did inject some excitement into the dish. I knew we were in for a treat when I saw Take scooping innards out the shrimp head to make a sauce for the nigiri. The result was one of the best sweet shrimp I've had in a long while. The shrimp was perfectly snappy and sweet while the sauce exhibited a wonderful offaly richness without any jarring metallic flavor. My only complaint was the amount of sauce which soaked through the lightly packed rice making a mess of things even though I ate this with my fingers. 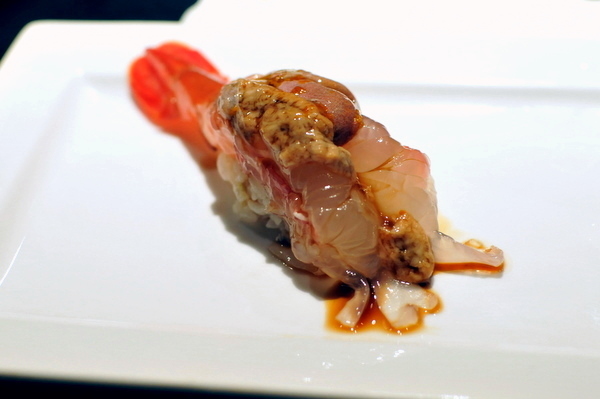 This was my first time having Whelk, a type of sea snail, at a sushi restaurant. 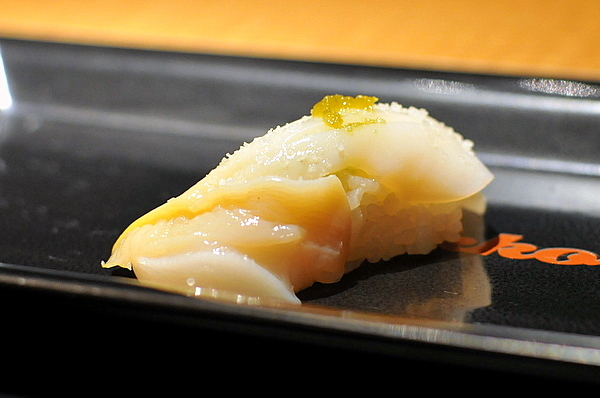 The texture is quite unique, not as dense as abalone or mirugai, but still presenting a snappy, grippy, almost cartilaginous texture. Our waitress called this Kasabo, or sting fish. 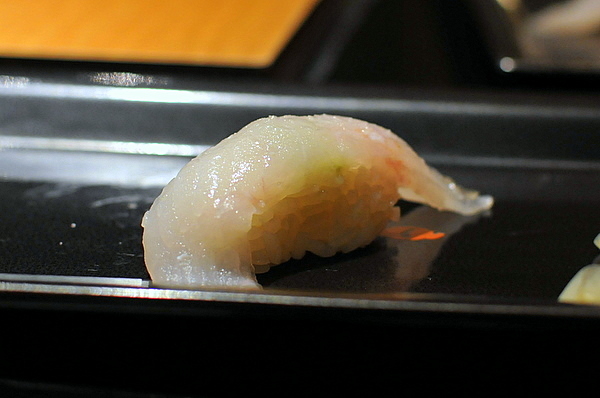 Supposedly the fish causes a light numbing effect, similar to fugu when ingested but I failed to notice it. If anything the fish reminded me of a snapper, light clean and soft. What to say, buttery soft and it dissolves on the tongue, I would have liked to try the raw preparation but I was still satisfied with this. Given that Take had pulled out everything of value from the head, it made sense to make soup from the remnants as the shell still had enough flavor to give the soup a light oceany twang. This is the first time I've seen Iberico pork nigiri style. The char-tinged savoriness is reminiscent of a seared toro or seared wagyu though the texture is a bit slicker and I definitely parallels to the more common Jamon Iberico. 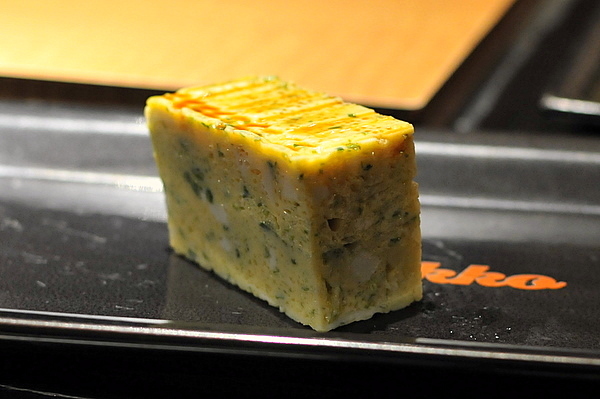 Ikko does their tamago with a light brush of savory sauce which highlighted the eggy funk of the tamago. I always love sesame desserts but this was a bit of a let down. 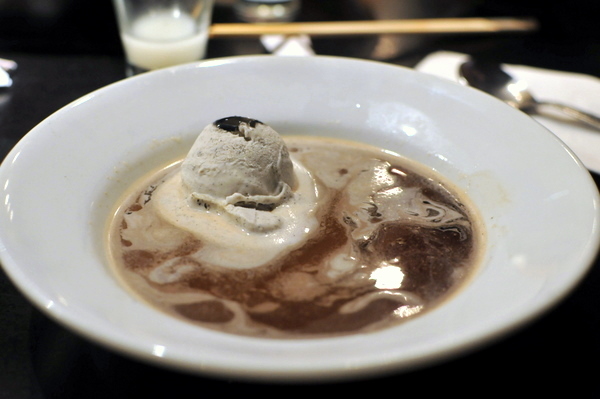 Aside from the contrasting temperatures, the coffee completely overwhelmed the sesame on the palate. 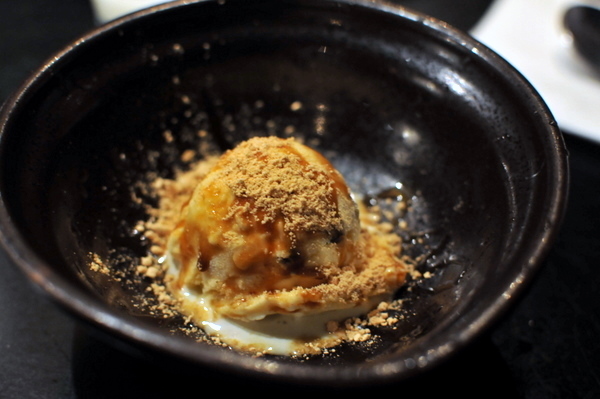 The second dessert was absolutely sublime, the ice cream was decidedly thick but soft while the creamy vanilla in conjunction with the caramelized sweetness of the Kuromitsu and the nutty Kinako reminded me of a Japanese inspired Snickers bar. So is Ikko the best in OC? I think the answer is a qualified yes. Ikko is certainly no slouch when it comes to traditional nigiri, though I'd probably give a slight nod to Oshima or Nana-san if we were talking sushi only. Ikko sets itself apart though its kitchen; deftly incorporating French techniques but doing so thoughtfully and in a way that still maintains the integrity of the food. 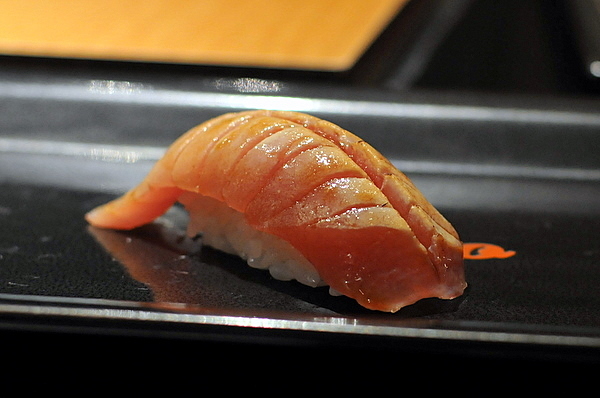 The result is a sushi restaurant where the cooked dishes delight as much as the raw fish does; that isn't something I can say for many of Ikko's peers.